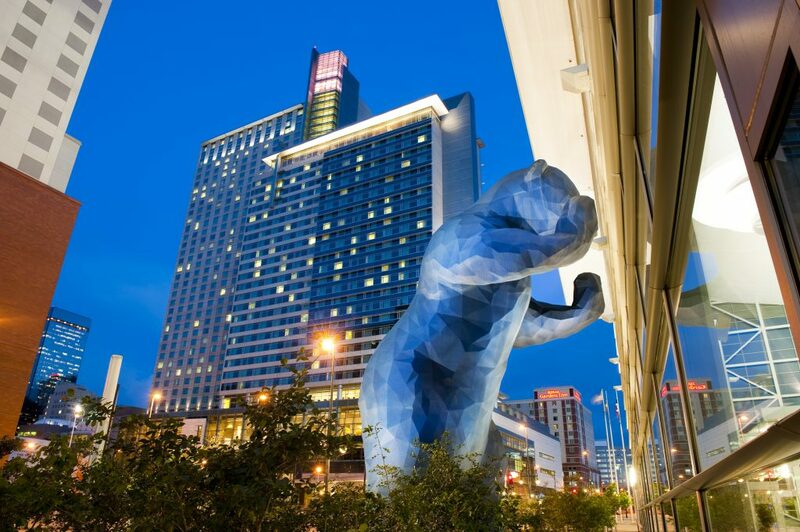 Blue Bear peeking into the Colorado Convention Center. Courtesy VISIT DENVER. Colorado is a great place to hold a convention. The natural surroundings of the state can help you have a better attendance because convention attendees will plan activities in the mountains as well as family vacations that dovetail with your event dates in Colorado. Despite it’s laid-back Western-styled culture, Colorado has proven it can host the biggest of the conventions like the Democratic Party in 2008, when Barack Obama was nominated. No matter what size of convention you are planning, big or small, The cities in Colorado have a convention center to meet your needs. Metro Denver is the largest city in the state. It’s international airport offers convenient air service from just about anywhere in the world. Many of the large hotels in the city have their own convention facilities. The 500 room Grand Hyatt in downtown features 58,000 square feet of convention space. It’s sister property, the Hyatt Regency has 60,000 square feet of its own space and is also adjacent to the Colorado Convention Center. The Inverness in the South part of the city is a good example of a “convention resort”. Visit Denver, The Convention and Visitors Bureau can help you narrow down the choices. Boulder, while near to Denver is a convention destination all its own. It features the new, 200 room, St Julien Hotel and Spa which has over 10,000 square feet of convention and meeting space. The venerable Millennium Harvest House Hotel features 18,000 square feet of space. The Boulder Convention and Visitors Bureau can help you create an intimate convention sure to be remembered for years to come. Fort Collins is further North, about 65 miles from Denver. It can serve a special purpose for many types of small conventions and you should contact the Fort Collins Convention and Visitors Bureau to learn more. To the South of Denver, lies Colorado Springs, which is home to the Air Force Academy and the US Olympic Training Center. It features some fantastic facilities for conventions, including The Broadmoor with 185,000 sq. ft. and Cheyenne Mountain Resort with 40,000. The Colorado Springs Convention and Visitors Bureau can fill you in on these and other potential choices. Out on the Western Slope of the state you will find the cities of Grand Junction and Durango. Each of these small cities serve as trade hubs for their regions and feature a Convention and Visitors Bureau who are eager to help you plan your convention with them. No matter how you slice it, count on Colorado to deliver a winning metro destination for your convention goers that will be hard to beat.